Why Do You Choose Our Electric Clippers ? suitable for small, medium, large dogs and cats. comfortable, relax and enjoy their grooming time. hair for dogs, cats, horses and many other animals with hair. left, then push the whole blade to disassemble the cutter. Second step: To avoid the dropping of cutter, use the other hand to hold it. First step: Fine-tune the adjusting ring to 2.0mm before assembling the cutter. Second step: Align and insert the cutter into the clipper slot. Third step:Press down the cutter until the 'click sound' is heard. ★DON'T WORRY ABOUT HALF OF WORK WITHOUT ELECTRICITY - The professional pet clipper has a rechargeable 2000 mA Li-lion battery inside,it can be used for 6 hours with a full charging which is 5-10 times as much as an ordinary electric clipper, the charging time about 3 hours.When the battery is low, you can be sure to use the plug. ★SURGING POWER UPGRADE VERSION OF 3.7V PROFESSIONAL MOTOR - Up to 9000 rpm,more powerful and longer service life,the pet clipper will not be stuck by hairs.The copper eccentric wheel is used to connect the motor and the blade,so that the pet clipper has strong wear resistance,quick heat dissipation,sharp and durable,and stable sound.The smart chip protect the circuit from damage. ★2 BLADES - One 33 teeth and one 27 teeth titanium alloy white ceramic blade.The upgrade blade can cut 40000 hairs quickly,the tight pitch between teeth is favorable to control the single tooth's capacity of hairs,the less the hair is inserted, the easier it is to cut the hair.The 33 teeth blade is more suitable for pet with bushy hairs. ★ABSOLUTELY GUARANTEED PET SAFETY - It can be sure to touch pet skin after treatment of R type blade obtuse angle.Advanced Q-SUS silencing technology that reduce the friction between the moving blade and the stationary blade which effectively reducing the noise to avoid being frightened by pets. 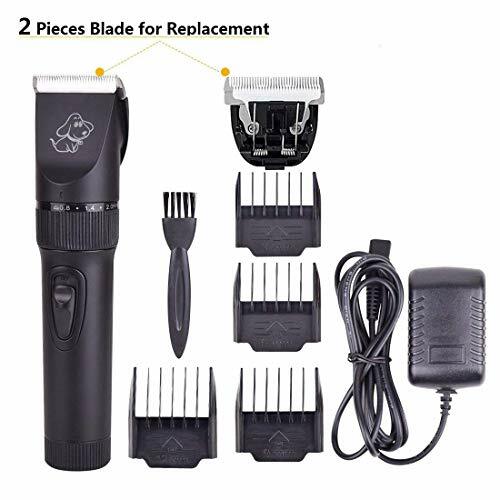 ★SUITABLE FOR ALL PETS - 5 level adjustable blade and 4 level different spacing combs,you can easily decide the length of hair you are going to leave without the aid of comb. Kids boys hair clippers/trimmer. Suitable for baby, children,small, medium and large dogs, cats.dog shaver, pet cat dog clippers.